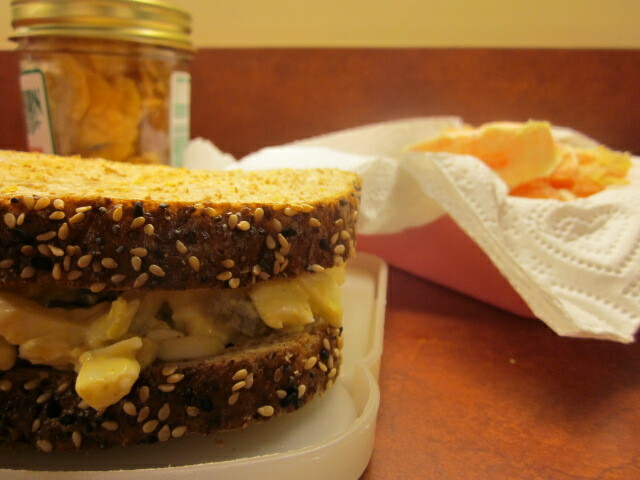 The key to my egg salad lies in the homemade pickles! I add a little mayo, a little mustard, a little dill, a little paprika, a little salt and pepper…and lots of pickles. If you would like to give my egg salad a try, try out the pickle recipe my Mom uses to make these amazing pickles. They are also wonderful in tuna, macaroni salad, etc. I think they are a little strong to eat by themselves, my little boy does and he loves them. Wash cucumbers, put (whole) in Brine. Brine =1 cup coarse salt to 1 Gallon water. Let set for 1 week – stir occasionally. Remove from Brine – Rinse – cut in desired sizes (I go ahead and cut mine into egg salad size pieces). Soak for 3 hours in mixture of 1 cup Lime to 1 Gallon water – Stir frequently. Take out of Lime – Rinse until water is clear (about 5 times). Heat to boiling – 1 cup of sugar to 1 cup Red Vinegar (no less than 5% acidity) Make enough to completely cover pickles. Let set for 1 day. Each day for 4 days pour off liquid and bring to boil – on the 4th day boil pickles and liquid together for 30 minutes. Add 1 tbls pickling spices to every 1 gallon vinegar. Put in jars and seal using a water bath. For water bath instructions the YouTube video Tips for Water-Bath Canning For Dummies is great! I have made these pickles and if I can do it anyone can! Does anyone else can? What have you tried? Was it worth it? My to-do list includes becoming more comfortable with canning and trying different types of pickles and vegetables in the future. Yes I can and everything is more than worth it! If I don’t can it, I freeze it. My mom recently told me that my grandpa used to grow grapes and grandma used to make enough jelly for the whole school year (for 5 kids). I’m inspired!